Unless your brake drums are grooved, the drum should slide right off. Sometimes rotating the drum will help. If you have to back off the adjuster, you will have to make a tool to lift the adjusting lever off the teeth to be able to rotate it backwards.It works like a ratchet and only tightens unless the lever is lifted off of it. Hammer and Discretesignals; Thanks for the reply. Hammer - Unfortunately, they do not simply pull off. I have tried to pull them like I did on my pickups but without any luck. I'm assuming I'll have to purchase some kind of tool to fit through the access hole in the backing plate to back off the auto adjuster. I'll check with my parts guy this evening. Discretesignal; The diagram you provided is a huge help. It shows a slot through which a couple of screwdrivers are placed to manually loosen the auto adjuster. On the Vibe it only has a small hole not much larger than the finger nail on my index finger. I did not find a slot as shown in the diagram. Perhaps I didn't look close enough. I'll have another look this evening. Gentlemen - If you had your choice of repair manuals to purchase, which would you use? The Haynes or Chilten (I think that's the other one) manuals? Thanks for your expertise and assistance. If need be just get some cheap flat head screw drivers such that two fit in that small hole, bend one to act as a brake spoon for star adjuster and another small one so it can move the lever away (unseen really) such that adjuster can retract instead of only going in ratcheting direction to tighten it more. If drum is free from hub. If not get that and drum should wiggle but not come off if shoes too tight against a rust ring or area not worn from the shoes. If you had your choice of repair manuals to purchase, which would you use? The Haynes or Chilten (I think that's the other one) manuals? Knowing what I know now, neither. They both are about the same when it comes to content. They are usually vague and have horrible wiring schematics. I'm not a saleman, but if you want good service information subscribe to Alldata DIY and warm up the printer. Yep, Alldata all the way. Okay, I signed on to Alldata DIY and it appears to be a great source of information. Thanks for the tip. Maybe this job isn't for you. 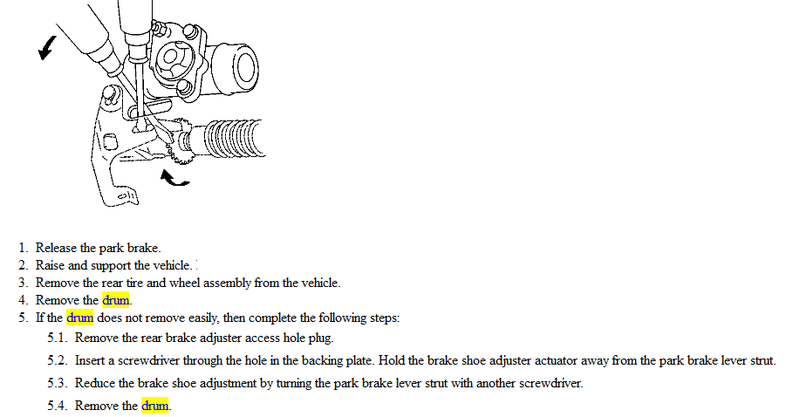 You have an AWD vehicle which means there is an axle going through that hub and the hub bolts from the rear. How do you propose you are going to get those bolts out with the axle in place? Hammer - It's not that I can't do the job - it's rather simple compared to some of the repairs I did on my trucks - I was just curiosity, thats all. Plus, this is a challenge because compared to the trucks, everything on the car is micro so locating things is a bit different. Once I found what I was looking for, the brake drum removed without any effort whatsoever. In the trucks, I was able to sit upright inside the wheel well and have a great view of everything behind the backing plate. That can't be done with the car so I have to adjust. This is my first car I have ever owned, so it's a learning curve for me. Plus, I never turn away from a challenge. Update - The new rear wheel bearing/hub assembly is in place. It went in much easier than the one that came out. All that remains to be done is re-install the brakes, bleed the system and go for a test ride. That'll happen in the morning.